M A4 S1 is an unrealized project for a bicycle- and pedestrian-bridge in a suburban area outside Copenhagen. The bridge is connecting residential areas and the local train station. 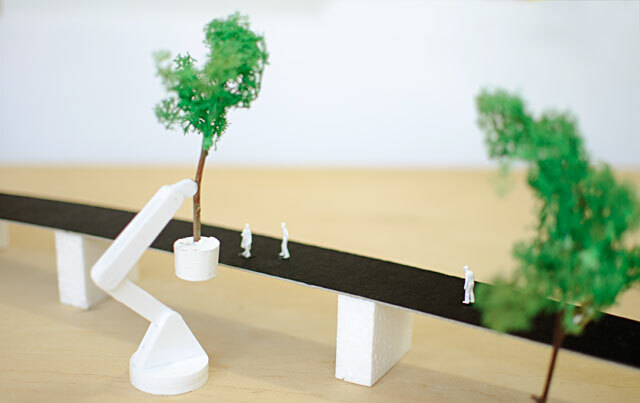 The project consists of a small number of living trees mounted on hydraulic robotics arms. The location of the trees shifted according to traffic on the bridge. During busy morning hours, the trees would be elevated and moved in close proximity to the passers on the bridge. During off-peak times, the trees would be lowered onto a green carriageway below. Nature would become available as a service for the commuters.